PhaseWare Tracker is a customer support platform that enables businesses to streamline their workflows, automate basic tasks, effectively manage incidents as well as their performance with the aim of delivering a fluid customer support experience. The product comes with a slew of tools including supporting knowledge base application that encourages customer self-service. For customer support agents, PhaseWare Tracker boosts their productivity and improves their performance, thanks to a single interface where they can perform their functions seamlessly. These functions include managing customer details, prioritizing cases, and researching solutions among others. Users can either have the platform hosted in the cloud or on-site. Customization options are so vast that you can tailor the platform right down to your specific needs. Multi-channel support enables users to engage their clients and deliver support in any and every known vehicle, including a knowledge base, live chat, email, and more. You can improve your business’ first call resolution rate and raise customer satisfaction levels. It lets you reduce the number of phone calls requesting for support. You can gain more time to address more pressing and important matters. Every business is different, and can need a particular type of Customer Support Software solution that will be designed for their company size, type of clients and employees and even specific industry they support. You should not count on getting a perfect software that will be suitable for every business regardless of their background is. It may be a good idea to read a few PhaseWare Tracker reviews first and even then you should keep in mind what the software is supposed to do for your business and your staff. Do you require an easy and intuitive solution with only essential features? Will you actually use the complex tools required by experts and big enterprises? Are there any particular features that are especially beneficial for the industry you operate in? If you ask yourself these questions it will be much easier to locate a solid app that will match your budget. How Much Does PhaseWare Tracker Cost? Contact PhaseWare directly to get more information about the pricing of PhaseWare Tracker. Users can also try a free trial por request a live demo. We realize that when you make a decision to buy Customer Support Software it’s important not only to see how experts evaluate it in their reviews, but also to find out if the real people and companies that buy it are actually satisfied with the product. That’s why we’ve created our behavior-based Customer Satisfaction Algorithm™ that gathers customer reviews, comments and PhaseWare Tracker reviews across a wide range of social media sites. The data is then presented in an easy to digest form showing how many people had positive and negative experience with PhaseWare Tracker. With that information at hand you should be equipped to make an informed buying decision that you won’t regret. What are PhaseWare Tracker pricing details? 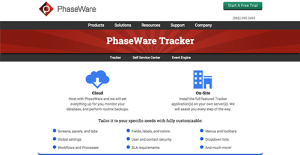 What integrations are available for PhaseWare Tracker? PhaseWare Tracker supports integration with Miscrosoft Outlook.